300uL Conical Glass Pulled Point Insert, Precision formed tip rests on vial bottom. 300uL Conical Glass Precision Point Mandrel Interior Insert. Insert rest on bottom of vial. 300uL Polyspring Glass Conical Insert. Polyspring centers insert to the vial bottom and cushions against needle contact. 300uL Polyspring Polypropylene Conical Prescision Formed Tip Insert. Polyspring centers insert to the vial bottom and cushions against needle contact. 400uL Glass Flat Bottom MicroSert with Fill line at open end. Inset rests at vial bottom. 400uL Polypropylene Flat Bottom MicroSert. 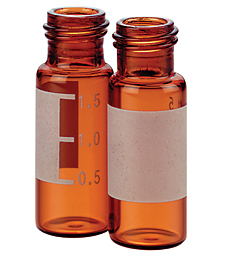 Insert rests at bottom of vial.